Being able to communicate effectively and with confidence is a life skill that all successful adults need. Tom Newby School has an on-site Confident Kids Centre that develops, through drama and speech lessons, confidence in public speaking and drama. 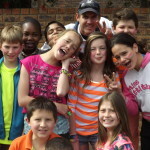 Confident Kids is an outsourced activity and fees are controlled by the activity organisers. Please contact the Confident Kids organiser for details regarding fees (approximately R400.00 per month). Confident Kids takes place from February to November and is offered after school hours, on school premises. Practice times and venues may vary. The Confident Kids organiser will communicate the quarterly schedule to participants. Casual and comfortable clothing is recommended. No special equipment is required.